I put Moonlight Drawn By Clouds on hold for weeks on purpose. Maybe I didn’t want to let it go or maybe because Moonlight somehow turned into a sad, depressing show. I didn’t sign up for it. The first half was full of fluffiness, cuteness, heart-throbbing moments. But passed halfway mark, Moonlight slowly lost its first-half charm. I’m not complaining though. Intrigues are always needed in every drama/movie to spice things up. But I felt betrayed, I didn’t sign up for anything not-sweet for the OTP. I was never a fan of Park Bo Gum. When everyone praised his acting in Hello Monster I was the only one who wasn’t drawn into his acting. He didn’t fully give me that creepy vibe that a psychopath characters in dramas usually gave off. So I didn’t get the rave about his acting. He was really just mediocre for me. Moonlight proved me wrong. He was great here. He owned his character, Lee Young. His gaze was spilling with honey every time he looked at Ra On (played by Kim Yoo Jung). He’s definitely not at that excellent level yet –let’s say, Yoo Ah In level- but he has potential. In Moonlight, Park Bo Gum was above great but not at excellent level yet. Just somewhere near amazing. Kim Yoo Jung’s very first project that I watched where she’s the female lead. She’s been in many projects before but I don’t really remember much of her acting in those. I loved her portrayal so bad! I loved how she really let go her girly image and so immersed in her character during her Sam Nom days. For example, her voice sounded not like a girl’s voice but like a boy’s! Her acting was natural and so relaxed. Like, she was Ra On herself. She made it very easy to connect with her character. 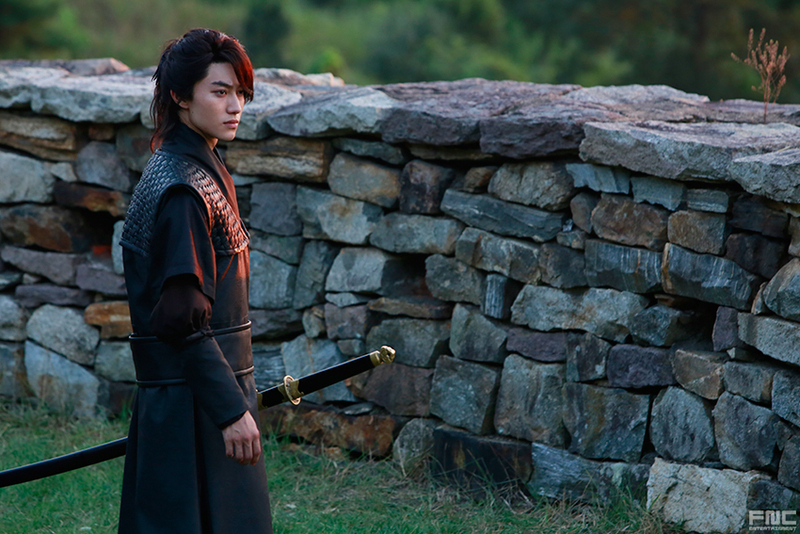 Kim Hyung (played by Kwak Dong Yeon) was great too! I don’t really remember his acting in his previous works but he was good here. Honorable mention: Han Soo Yeon as the Queen. There were times when I felt really intimidated by just seeing her face on my laptop screen. She perfectly pulled off this role and wicked aura just radiated from her. She was crazily great! The filters were lovely!!! The cloudy filter they used for the very last scene was a smart move making scene looked so dreamy. I liked that there were plenty of close up shots that perfectly captured the casts’ emotion. The location choices were good! And can we talk about how beautiful the posters and the stills are?!! LOOK. AT. THEM. foreword: I’m not going to talk a lot about the plot since I basically have nothing to say. I lowkey have no motivation to write Moonlight review LMAO. Some people got into Moonlight because of its lineup. Some because of its plot. And the rest, because of the positive reviews Moonlight got. I was in the 3rd category. I wasn’t a fan of any of the casts. I didn’t know the plot at all. But reading positive comments from K-nets attracted me. I was very curious about this drama that everyone was raving about. The first episode went pretty cool. Despite Cha Tae Hyun’s special appearance in episode 1, episode 1 was pretty lackluster for me. but it got better as the story progressed. Just one word though, cringey!!!! The story was cringeworthy so so much. The dialogues were cringeworthy. The whole atmosphere was cringeworthy. But, just like what the others say, its cringey plot was one of Moonlight’s addicting points. You won’t hate the cringey parts, it’s very natural and cute. I’m usually the type who hates cringey things but Moonlight made me squealed! The first half was definitely light, cute, fluffy, everything you could think of. That’s what sucked me in. Moonlight then decided to get too serious and it was no fun. I mean, my job already made me cry why should I cry again at home watching this drama. I don’t know how’s your feeling going to be when you put the last 4 episodes on hold for like 2 months. Mine, was empty. When I finally watched the 15th episode I didn’t get excited like I used to. I did skim through episode 13 & 14 before jumping to episode 15. If you say it’s because I might forgot the story then you’re wrong. I seriously think Moonlight’s strongest point was the two leads’s sizzling chemistry. Other than that there was nothing memorable. Saddening but it’s true. I am probably the only one who’s fine with the last episode. Unlike the popular opinion about it, I think the last episode was perfect as it is. It wasn’t too fast. It just suited my liking. Baek Ji Young’s “Love Is Over” would be much more fitting if the lyric was full in Korean. Love Is Over line could be replaced with its Korean word. Each song is good on its own. But when it comes to Moonlight I think it’s pretty safe to say that Gummy’s “Moonlight Drawn By Clouds (구르미 그린 달빛)” is the representative song of this drama. Will I Watch it Again? Nope…..